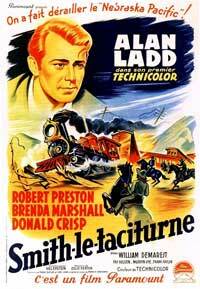 A frequently-told western railroading story with Alan Ladd in the title role of the railroad detective. 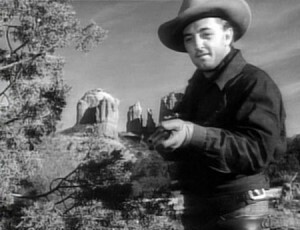 It was at least the sixth filmed story featuring the character Whispering Smith. It’s melodramatic, with Ladd looking not entirely comfortable in his first western role and his first color film as a major star. He was more convincing by the time he did Shane four years later. 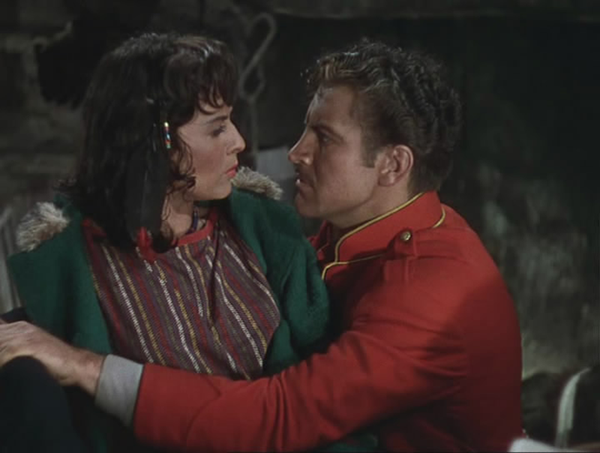 Whispering Luke Smith is a railroad troubleshooter, and his old friend Murray Sinclair (Robert Preston) has started a ranch of his own and married Marian (Brenda Marshall), whom they both loved. 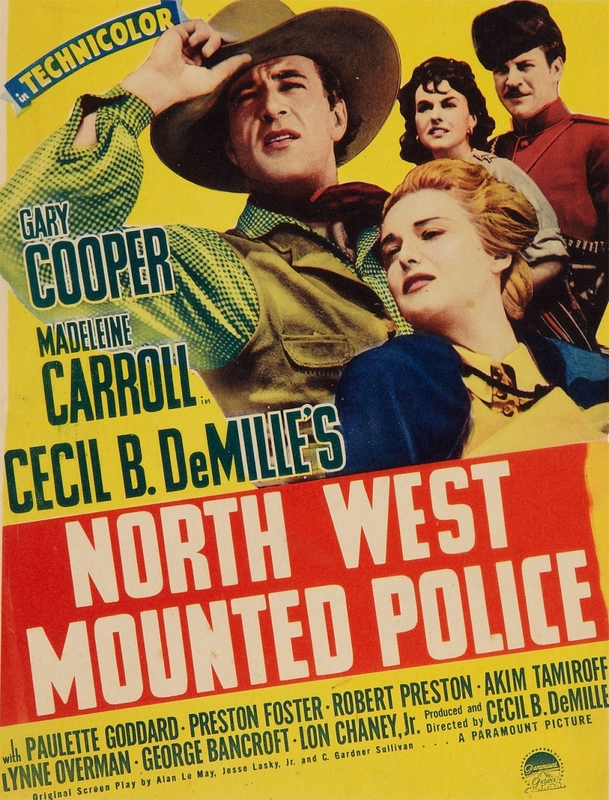 This is one of Preston’s patented old-friend-goes-bad roles, in which he seemed to specialize in the 1940s (see Union Pacific, North West Mounted Police and Blood on the Moon, for example). Donald Crisp, instead of playing the personification of occasionally misguided rectitude as he usually did in westerns (The Man From Laramie, Saddle the Wind, Ramrod), is here not terribly persuasive as Barney Rebstock, a bandit chief and rustler. 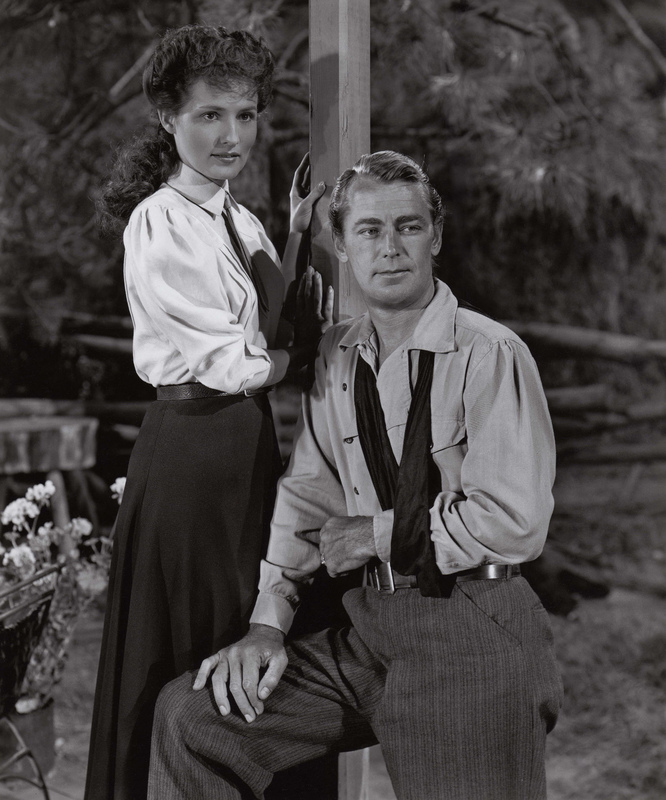 Alan Ladd as Whispering Smith; and production still of Brenda Marshall and Alan Ladd. Having Ladd sit down disguises his short stature, always a visual problem when he wasn’t sitting on a horse. In addition to running his ranch, Murray still works for the railroad, leading crews that clean up when a train is wrecked. But he is edging more into wrecking trains for his own profit, after feeling disregarded by the bureaucracy of the company. His relationship with Marian is becoming more strained as well, and he becomes more obsessed with the idea she might leave him for Smith. This ends as it usually did for Preston in such roles. 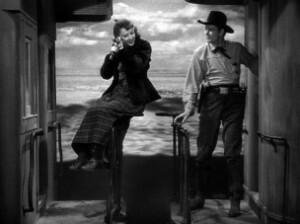 Smith spends the movie balancing the duties of his job against his friendship with Murray, as well as his continuing regard and affection for Marian, while Murray gets deeper into anti-railroad crime. Smith grapples with multiple bad guys, including the train-robbing Barton boys, Rebstock and his gunslinger Whitey, and it’s not clear until the end how his long-time friendship with Murray will turn out. Brenda Marshall, then married to William Holden, made only one more film before retiring from the movie business. Ladd and Preston were good friends, and this was the last of five movies in which they appeared together (This Gun For Hire, Variety Girl, Wild Harvest, etc.). Ladd later became more comfortable and persuasive in westerns. 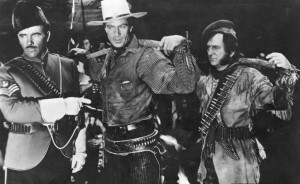 Not only did he go on to make the iconic Shane, for example, but he made a string of westerns in the 1950s, such as Branded, Drum Beat, Saskatchewan, Red Mountain and The Badlanders. In color, at 88 minutes. Frank H. Spearman wrote the 1906 novel first using this character; at least one edition was illustrated by N.C. Wyeth. The first Whispering Smith film was made in 1916, with the character said to be based at least in part on Joe LeFors, an actual western lawman (and sometime Union Pacific detective) based in Denver and Cheyenne who had chased Butch Cassidy and caught Tom Horn at the turn of the century. 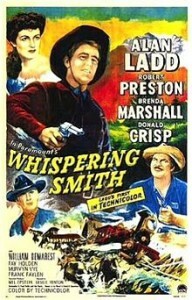 Whispering Smith was played by silent star George O’Brien when he drifted into the lower-prestige genre of westerns during the 1930s. 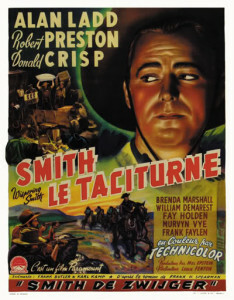 After this 1948 film, the character was used once more in Whispering Smith Hits London (1952), after which he was retired from the movies, apparently for good. 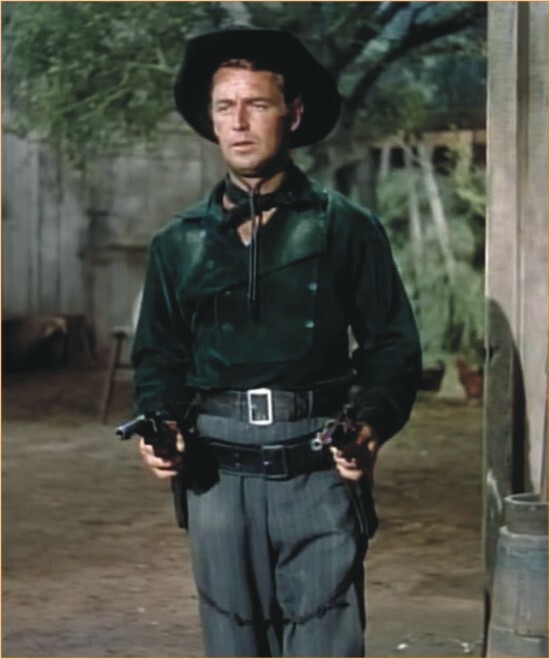 He showed up on television for twenty episodes beginning in 1961, played by Audie Murphy. 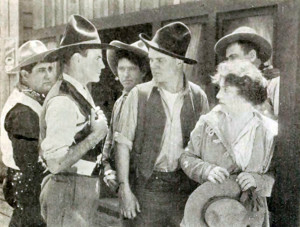 Whispering Smith (J.P. McGowan) in a scene from the 1916 movie of that name. This entry was posted in Westerns Worth Watching and tagged Alan Ladd, Robert Preston, Technological Westerns, Train Robbing, Trains on March 9, 2015 by Nicholas Chennault. It is 1885, and the Second Riel Rebellion is brewing among the mixed-ancestry Metís (pronounced “meet-us” in this movie) people of Saskatchewan in Canada. Louis Riel (Francis McDonald) is retrieved from Montana, where he has been teaching school, by Dan Duroc (Akim Tamiroff) and Jacques Corbeau (George Bancroft, who had played the good-hearted sheriff in Stagecoach the previous year). 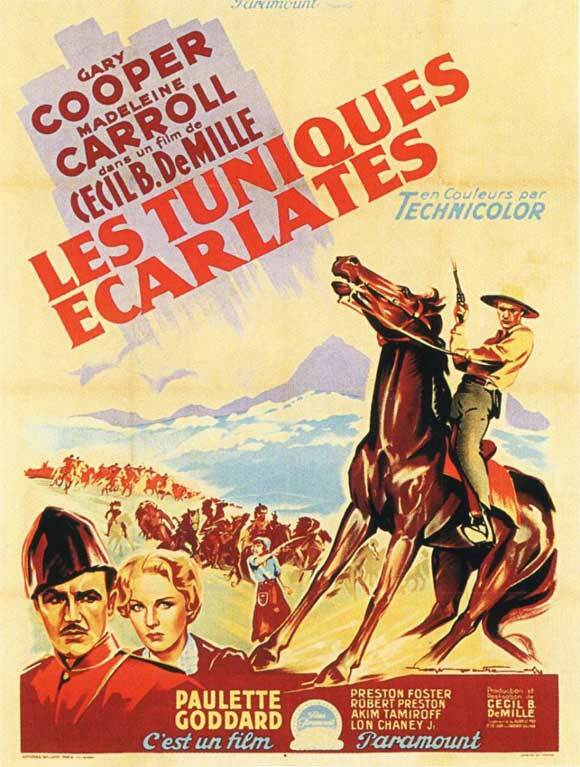 Riel has reservations about any association with the rough Corbeau, who has a history of running liquor and guns to the Indians, but Duroc persuades him to go along because Corbeau has a gatling gun which will equalize things with the Queen’s forces. 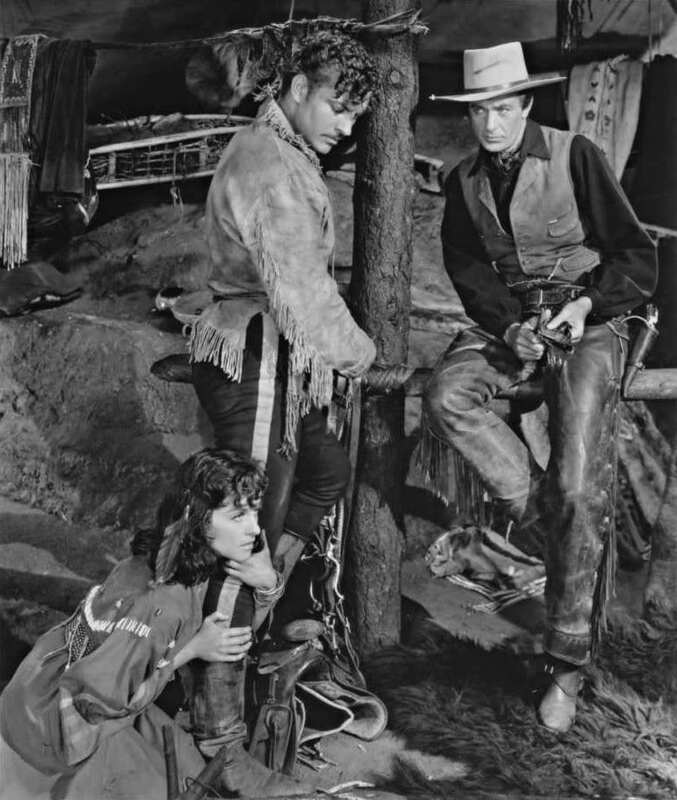 Ronnie Logan (Robert Preston) and the fiery Louvette (Paulette Goddard). Two red-coated Mounties, Sgt. 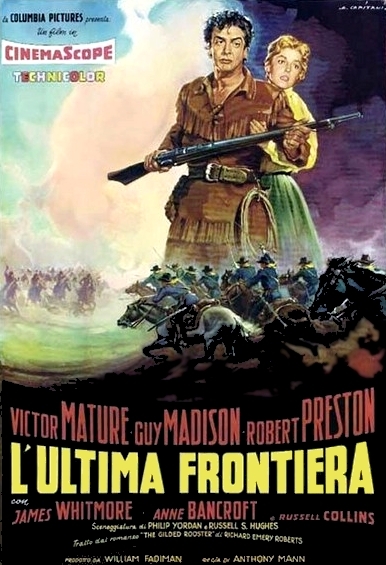 Jim Brett (Preston Foster) and Ronnie Logan (Robert Preston) discover in Batoche, the Metís capital, that the rebellion has reached dangerous proportions, with Big Bear’s Crees on the verge of joining the Metís. 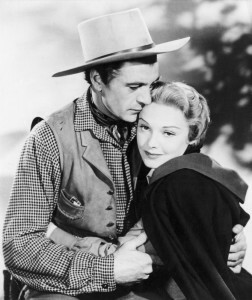 Romantic interests are established for both of them, Logan with Metís maiden Louvette Corbeau (daughter of Jacques Corbeau, played by Paulette Goddard as kind of a dark-skinned, blue-eyed Gypsy) and Brett with Logan’s sister April Logan (Madeleine Carroll), a selfless nurse among the Metís in Batoche. She doesn’t seem convinced that Brett’s for her. 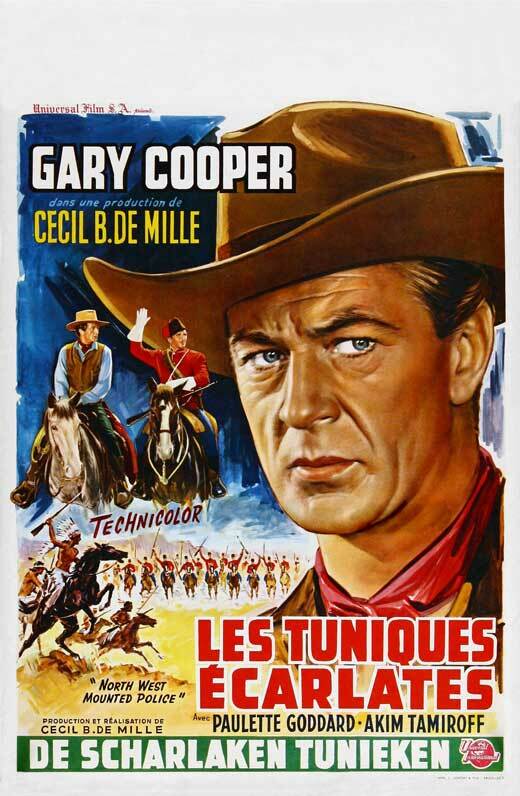 Into this cauldron of brewing rebellion and budding romance rides a Texas Ranger, Dusty Rivers (Gary Cooper), who is looking to arrest Corbeau for a murder in Texas. He is received dubiously at Fort Carlton, especially by Sgt. Brett, when he develops an immediate attraction to April Logan. Brett goes off to persuade Big Bear to remain allied to the Queen, but when Corbeau promises to bring him red coats covered with blood, Big Bear gives him three days to do that before he will join the rebellion. Sgt. 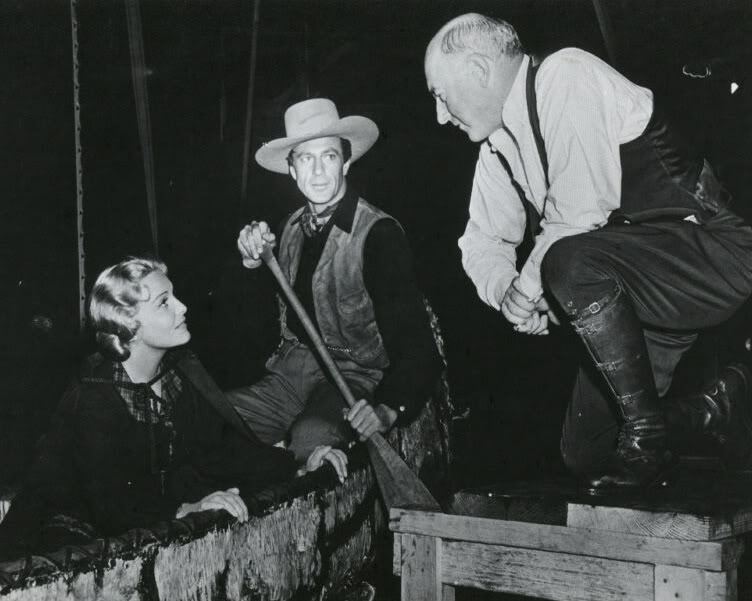 Brett (Preston Foster) negotiates with the Crees for Rivers (Gary Cooper) and a Scottish scout (Lynne Overman). Ronnie Logan and another Mountie are sent off to remote guard duty at Duck Lake. When April hears of the seriousness of the rebellion, she sends Louvette Corbeau to warn Ronnie. Instead of warning him, she lures him into a situation where she can take him prisoner. In his absence, a column of Mounties are mostly massacred at Duck Lake, including the commander (played by Montagu Love). His dying command to Brett is that he get Ronnie and make him pay for his desertion. While Sgt. Brett takes command of the few surviving Mounties left at Fort Carlton, heading on an apparent suicide mission to Big Bear, Rivers helps April flee the burning fort and heads for Batoche, where he distracts the defenders by cutting their canoes loose and destroying the gatling gun. He helps Ronnie escape the clutches of Louvette, only to see him cut down by an Indian assassin hired by Louvette to get Rivers. Rivers liberates Ronnie Logan from his scheming captor Louvette; River woos nurse April Logan (Madeleine Carroll). At Big Bear’s camp, Brett is improbably successful at retrieving the Crees’ loyalty and the rebellion seems to be over, with Duroc dead and Riel and Corbeau captured. A Mountie tribunal is on the verge of convicting Ronnie of desertion, until Rivers comes in and attributes to Ronnie his own efforts in destroying the gatling gun at Batoche, saving Ronnie’s reputation. At the end, he abducts Corbeau to take him back to Texas, but as he leaves with his prisoner, Brett and April find him and announce that April is marrying Brett. But Brett allows Rivers to take Corbeau and leaves Rivers’ version of Ronnie’s heroism to stand even though he suspects otherwise. 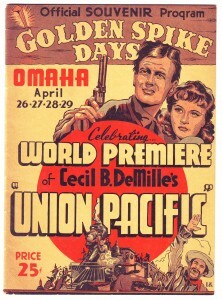 Joel McCrea had starred for DeMille in Union Pacific in 1939 and was the first choice to play Rivers. But he dropped out to do Alfred Hitcock’s Foreign Correspondent and was about to be cast in two Preston Sturges films (all included in the best work of his career), so the role went to Gary Cooper. English actress Madeleine Carroll had made her reputation working with Alfred Hitchcock as the first of his cool blondes (The 39 Steps, Secret Agent) and in costume dramas (Prisoner of Zenda, Lloyd’s of London). By 1938 she was said to be the highest-paid actress in Hollywood. After her sister Marguerite was killed in a London bombing raid, she spent the rest of the war as a field nurse and in other war efforts. She became a U.S. citizen in 1943, but her career never revived after the war. 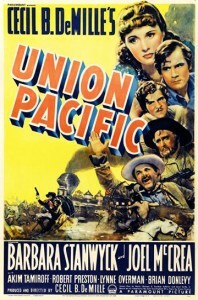 At this stage of his career, Robert Preston often played the friend or brother who went bad (Union Pacific, Blood on the Moon, Whispering Smith), and his character usually died because of that. Several young actors, including Robert Ryan, Lon Chaney, Jr., Regis Toomey, Rod Cameron and Wallace Reid, Jr. (son of a silent star who died of drug addiction) play young Mounties or Indians. DeMille directs Carroll and Cooper as they flee Fort Carlton in a canoe. One of the screenwriters here is Alan LeMay, author of the novel The Searchers was based on. But the dialogue is clunky, and Cooper’s, in particular, is excessively of the aw-shucks homespun variety. Between that and his character’s too-precious name, it’s not one of his more successful performances. He could play frontier characters naturally and was doing so convincingly at this time in his career (playing western in The Westerner the same year, and playing Appalachian backwoods in Sergeant York, for which he won the Best Actor Oscar the following year), but it doesn’t work well here. Neither the abrupt end of the rebellion nor the abrupt change of heart by April Logan are entirely convincing, either. After the opening scene, Riel largely disappears, and we never discover why he’s essential to the rebellion. He certainly has little charisma as depicted here. This is one of the fifty movies listed in The Fifty Worst Films of All Time (and How They Got That Way) by Harry Medved and Randy Lowell (1978). It’s not that epically bad, but is it worth watching? It is if you are interested in either Cooper or DeMille, not to mention the beautiful Carroll. For another (and better) story of an American gone north, see Gunless (2010). For another story of Mounties and Indians, see Raoul Walsh’s Saskatchewan with Alan Ladd (1954). If you’re interested in the background of Canada’s Second Riel Rebellion, see Strange Empire by Joseph Kinsey Howard (first published in 1952). In color, at 126 minutes. Shot principally around Big Bear Lake in California, San Bernardino National Forest. The movie won an Oscar for Best Editing. 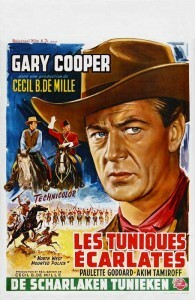 This entry was posted in More Westerns and tagged Cecil B. DeMille, Gary Cooper, Mounties, Native Americans (Indians), Northern Westerns, Robert Preston, Robert Ryan on June 27, 2014 by Nicholas Chennault. 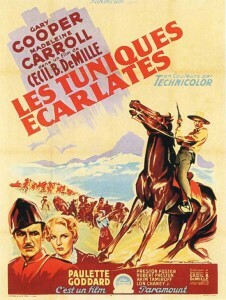 A watchable range war saga based on a 1941 novel by Luke Short. 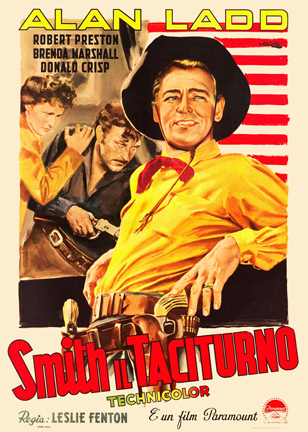 Jim Garry (Robert Mitchum) is drifting from Texas, when he’s invited by old friend Tate Riling (Robert Preston, in his sleazy friend mode) to join him in a get-rich-quick scheme with corrupt Indian agent Jake Pindalest (Frank Fayden). John Lufton (Tom Tully) is the local cattle baron, who has long provided beef for the reservation while grazing his herds on reservation land. Pindalest, on Riling’s urging, has given Lufton notice that he’ll no longer be buying Lufton’s beef, and Lufton has to find new grazing land. He’s trying to move his cattle back to the basin where he used to graze, but now there are homesteaders there to resist, led by Riling. 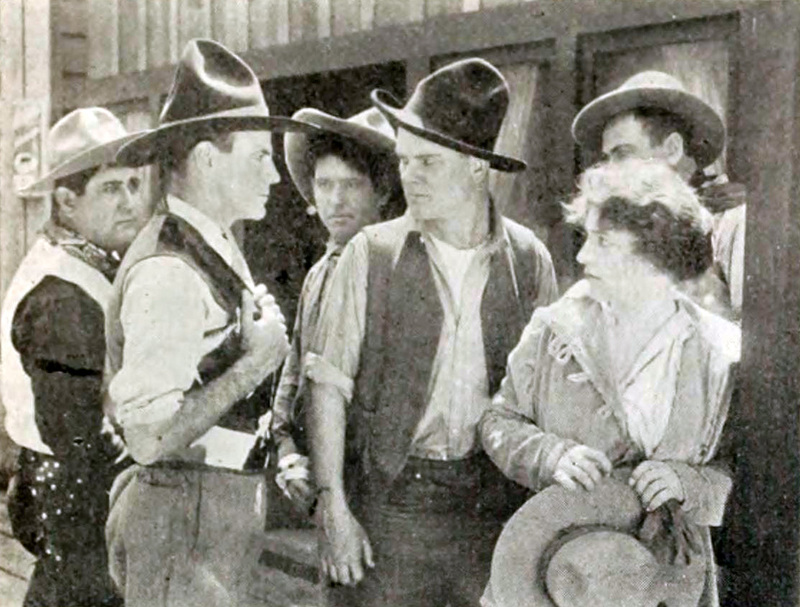 Kris Barden (Walter Brennan), who used to work for Lufton, is prominent among them. 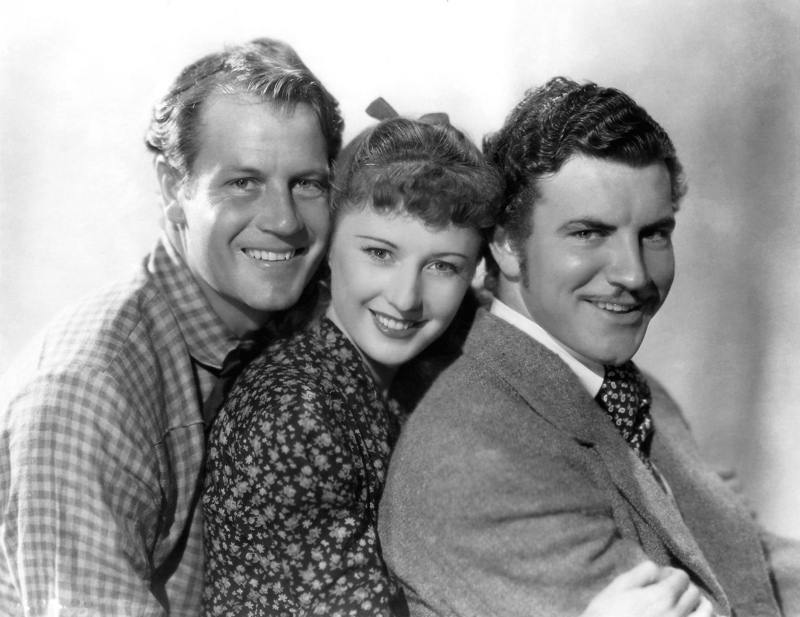 Lufton has two daughters, one of whom, Carol (Phyllis Thaxter), is romantically interested in Riling and the other, Amy (Barbara Bel Geddes), takes a few shots at Garry. After being fully informed of the set-up and participating in stampeding Lufton’s herd, Garry decides the scheme isn’t for him and saves Lufton from two of Riling’s gunmen. He’s hurt in a fight with Riling but gets Pindalest to tell the army to back off on the deadline for removing Lufton’s herd. Riling, PIndalest and a couple of gunmen come after Garry, who’s wounded and holed up at Barden’s place. Amy Lufton shows up to give medical care and help fight off the bad guys. (You can tell Riling’s sleazy because of the loud plaid jacket he wears.) In the end Garry kills one of the gunmen, shoots it out with Riling and gets Amy. A good cast, with a complicated story for the 90-minute length of the movie. Note Garry’s authentic-looking hat, different than 1950s-style hats in westerns. Some shots look like Monument Valley, but mostly it was filmed on the RKO lot in Encino, with some outside of Sedona, Arizona. Like Yellow Sky, released the same year, it has some noir-ish elements, especially in the use of light and shadow. 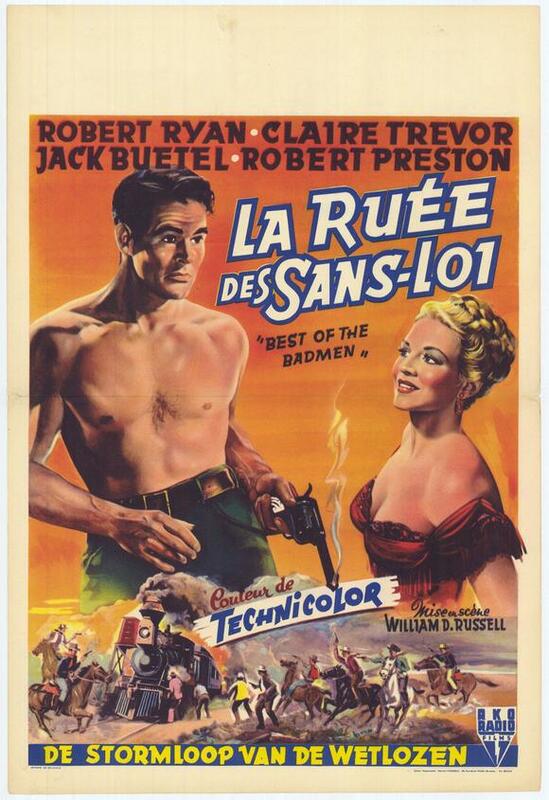 An RKO release in black and white, directed by Robert Wise (best known for The Sound of Music). Not yet available on DVD in the U.S. at the end of 2013. 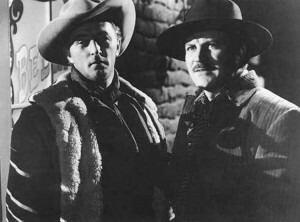 This entry was posted in Westerns Worth Watching and tagged Range Wars, Robert Mitchum, Robert Preston, Walter Brennan, Westerns Noir on January 18, 2014 by Nicholas Chennault. 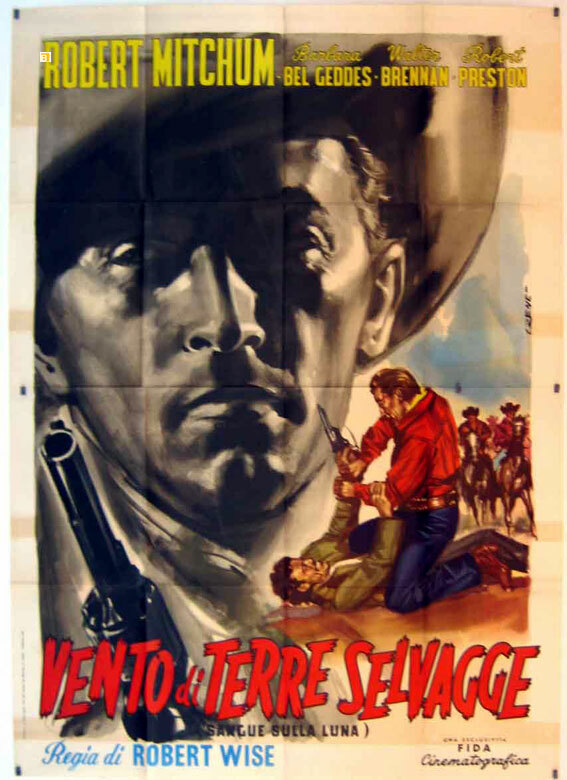 Since this is an Anthony Mann western (albeit without James Stewart), there are not one but two psychologically tortured characters. 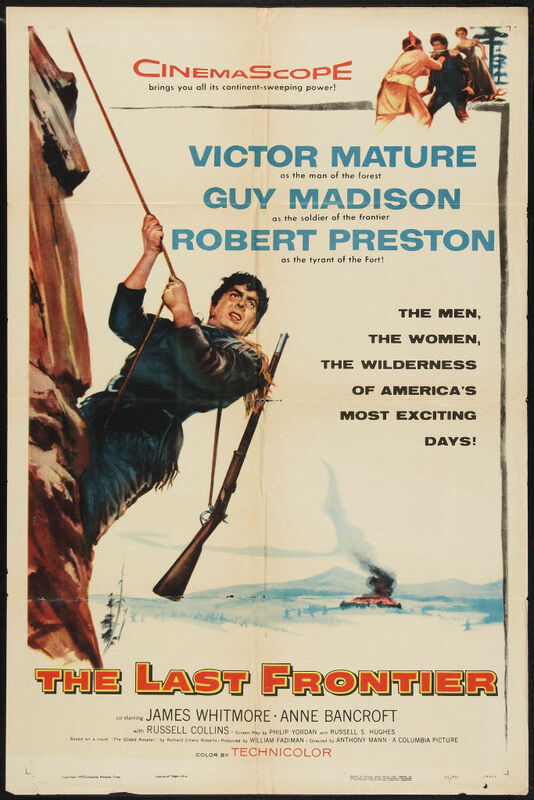 The first is Jed Cooper, an almost feral man-child played by Victor Mature, a trapper who has apparently been raised in the wilderness by Gus (James Whitmore). The other is Col. Frank Marston (Robert Preston), who got 1500 men killed in the Battle of Shiloh in 1862 and is now referred to as “the Butcher of Shiloh.” He seems both unbalanced by that experience and surprisingly confident in himself. It’s 1864 in the mountains of northern Wyoming and southern Montana, the land roamed primarily by the Sioux. Three mountain men-fur trappers (Gus, Jed and Mungo, an Indian of unspecified tribe) are taking the results of their annual labors to sell, when they are stopped by Indians who are painted for war. It turns out they are led by Red Cloud, who takes their guns, horses and furs and tells them they are no longer welcome in his lands because of the new fort built by white men. The three decide to head for newly-built Fort Shallan (fictional, apparently), which is understaffed because of the Civil War still raging in the east. Capt. Glenn Riordan (Guy Madison) is in charge, since his commanding officer was killed by Indians. He takes on the three as civilian scouts. Jed is fascinated by the military and civilization and its trappings, although he’s never been around white people much. Riordan won’t let him enlist in the military, judging correctly that he’s temperamentally and developmentally unsuited to such a regimented life. Jed is also taken with Corinna Marston (a blond Anne Bancroft), wife of the missing Col. Marston. She’s having none of his roughness, though. For now. Jed (Victor Mature) and Mrs. Marston (Anne Bancroft). Marston has been commanding Fort Medford (also fictional), from which his forces have been driven off and which has been burned to the ground by Indians. He arrives with a few soldiers and by virtue of his higher rank assumes command at Fort Shallan. 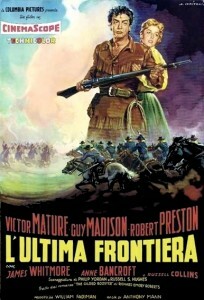 Marston is obsessed with getting back at the Indians in battle, whereas Riordan thinks the only hope for survival in hostile territory is to wait out the approaching winter in the fort, after which the Civil War may end and allow for more troops to be sent out to this remote wilderness. Fort Shallan’s troops are both untrained and too few to attack the Indians with any chance of success. It also becomes clear that there are tensions between the Marstons in their marriage. And Jed and Corinna become more attracted to each other; that is, Corinna allows Jed to get closer. He never had much restraint about his attraction to her. Col. Marston (Robert Preston) trapped in a bear pit. Far from giving up his plans for attack, Marston proceeds with them. He encourages a sadistic sergeant to attack Jed and when the fight results in the sergeant’s death, Marston calls for Jed’s execution. Jed escapes into the forest and observes as Marston leads out a force guided by Gus. The force is ambushed by Sioux, and Jed joins in the fighting, leading as many of the soldiers as can disengage back to Fort Shallan. Both Gus and Marston are killed. In the final scene, Jed is shown as a sergeant in a blue uniform at Fort Shellan in the winter. Corrina Marston is still there. Mungo (Pat Hogan) has gone back to the mountains. Jed scouts during the foolhardy battle with the Sioux. Somehow that seems an unsatisfying ending for a spirit as independent as Jed’s. Mann said that the ending was forced on him by the studio. 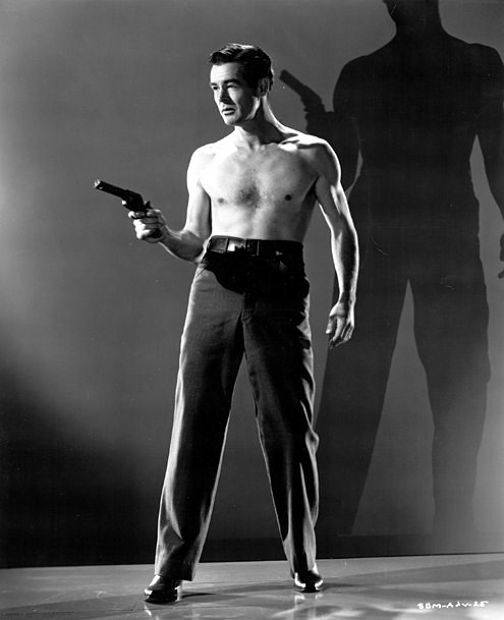 Victor Mature seems a little old to be as wild as Jed acts sometimes, but he’s fine. Mature was actually eight years older than James Whitmore, who plays his father-figure Gus and is said in the film to have raised him. The best performance in this film is given by Robert Preston as the snakily out-of-kilter Col. Marston (reminiscent perhaps of the Captain Queeg character who provokes a mutiny in the the World War II story The Caine Mutiny). Madison is good as Riordan, and Anne Bancroft is fine as Corinna. 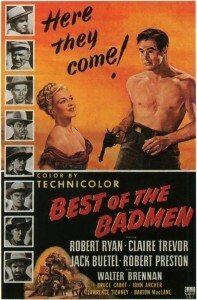 This is a watchable western, but not among Mann’s best. Based on the novel “The Gilded Rooster” by Richard Emery Roberts. In color, 98 minutes. Not to be confused with a 1986 television movie with the same title, set in Australia and directed by Simon Wincer. On television, this has sometimes been shown with the title Savage Wilderness. Although the story is set in the Northern Rockies, filming was done on location in Mexico. That snow-capped mountain looming above the fort and the forests is Mt. 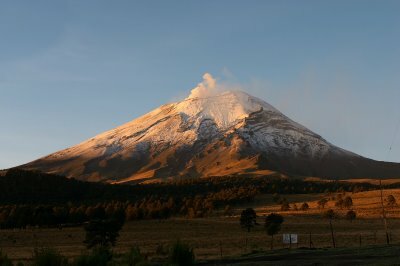 Popocatapetl. Historically, the events in this seem a little premature. Red Cloud’s War is usually dated from 1866 to 1868, when it was ended by the Treaty of Fort Laramie and the U.S. army gave up Fort Phil Kearney, which was burned to the ground by the Sioux as soon as it was vacated. It’s still generally considered the only white-Indian war in U.S. history which the Indians won. The effects of that victory lasted only eight years, however, until the next Sioux war, in which Custer’s Seventh Cavalry was wiped out but the Sioux, Cheyennes and Arapahoes were forced onto reservations and lost these lands in Wyoming and Montana. 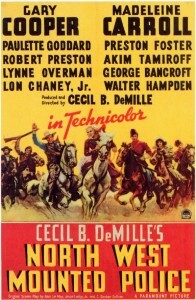 Some summaries place the events of this film in Oregon, perhaps because of the reference to Fort Medford and the beautiful mountain scenery, but Red Cloud’s war never got anywhere close to Oregon. It was concentrated along the Bozeman Trail from central Wyoming to the gold mines of western Montana. 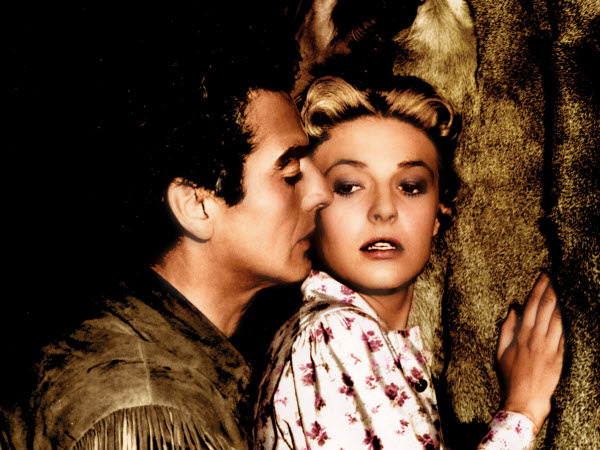 This entry was posted in Westerns Worth Watching and tagged Anthony Mann, Cavalry Westerns, Mountain Men, Native Americans (Indians), Pyschological Westerns, Robert Preston, Victor Mature on January 11, 2014 by Nicholas Chennault. In the movies’ greatest year, we had this rare western by one of the cinema’s greatest showmen. It obviously had a big budget, being made in the DeMille style, and was promoted very expensively. 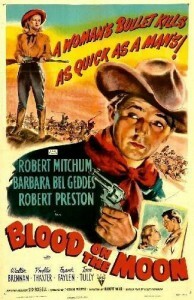 As well as being a great year for movies generally, 1939 was also a good year for westerns, with this, Dodge City, Stagecoach, Destry Rides Again, Frontier Marshal and the misbegotten curiosity The Oklahoma Kid. 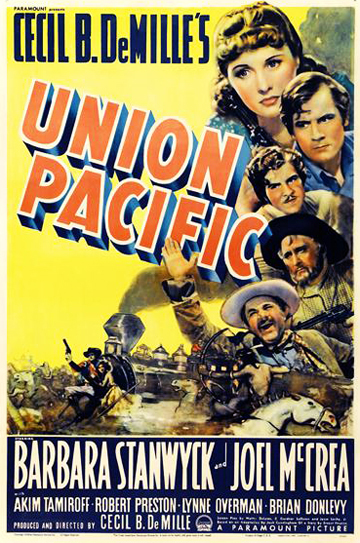 Its overarching story is the driving of the Union Pacific railroad line westward after the Civil War to meet the Central Pacific, overcoming all obstacles: outlaws, Indians, snow, unmet payrolls and unfriendly mountain terrain. The golden spike used in the meeting-of-the-lines scene is the real spike from 1869, borrowed from Stanford University. McCrea and Preston are very good in this, Stanwyck a little less so, although that may not be her fault with her part written so faux-Irish. Butler ultimately values his friendship with Allen and is able to escape hanging his friend, even when it becomes obvious that Allen has been involved in train robberies. As one would expect, Allen redeems himself as he dies at the end. At this stage of his career, Preston seemed to specialize in this kind of a role–the friend who goes bad (see North West Mounted Police, Whispering Smith and Blood on the Moon, for example). There’s a fair amount of spectacle here, with two train crashes (one caused by Indians, one caused by snow) and a major Indian attack, in addition to the nefarious outlaws. 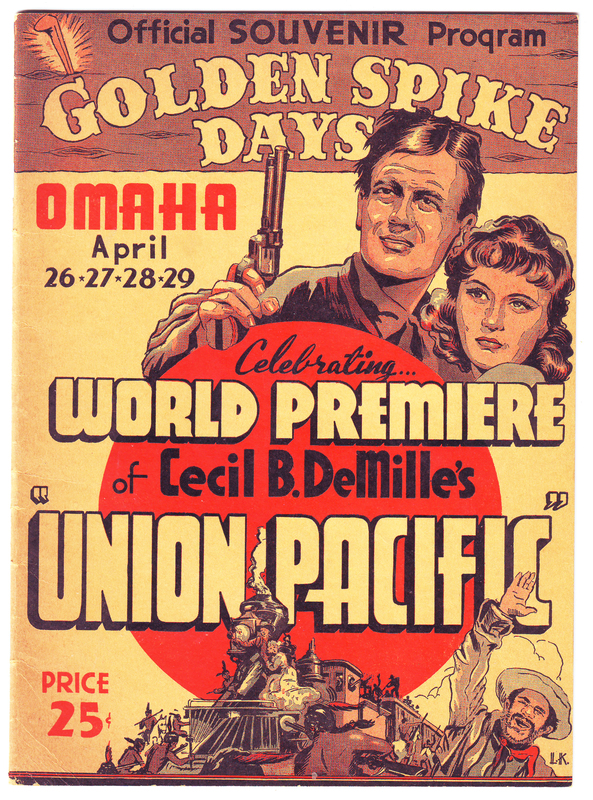 It’s in black and white, but so were most movies in 1939, especially westerns. (The exception: see Dodge City, below.) 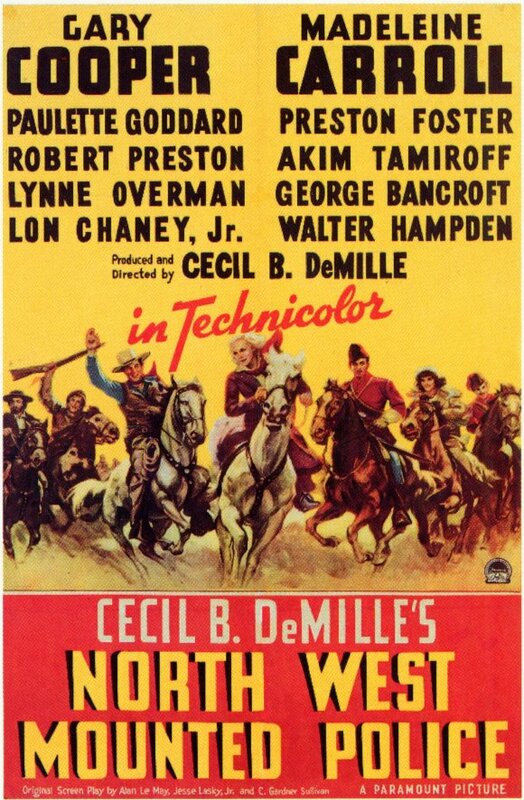 Compare this with the later (1941) technological western and winning-of-the-west epic Western Union, featuring Randolph Scott as the conflicted lead who has to sort out his loyalties while (a) being tempted by the dark side and (b) playing off straight arrow Robert Young. Both movies are quite watchable. 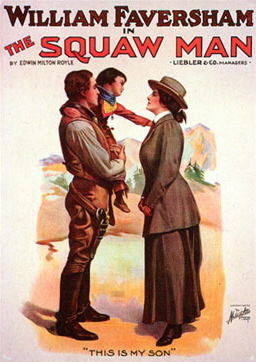 DeMille didn’t make many westerns, but some would say that he invented the feature-length western with The Squaw Man in 1914. By 1939, he’d been making movies for more than 25 years already. 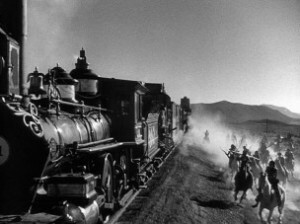 This entry was posted in Westerns Worth Watching and tagged Anthony Quinn, Barbara Stanwyck, Cecil B. DeMille, Joel McCrea, Native Americans (Indians), Robert Preston, Technological Westerns, Train Robbing, Trains on November 15, 2013 by Nicholas Chennault.